"We are all part of the global we; we must all work together to ensure a stable climate for future generations"
In an effort to publicize the release of the Intergovernmental Panel on Climate Change's 5th Assessment Report on the Climate, artist Olafur Eliasson and geologist Minik Rosing made the effects of global warming both immediate and impossible to ignore. The project, entitled Ice Watch, is meant to give the public a close-up, emotional experience with the often abstract concept of Climate Change. "As an artist, I am interested in how we give knowledge a body," said Eliasson in a statement. "What does a thought feel like, and how can felt knowledge encourage action? Ice Watch makes the climate challenges we are facing tangible. I hope that people will touch the inland ice on City Hall Square and be touched by it. Perception and physical experience are cornerstones in art, and they may also function as tools for creating social change." The ice of "Ice Watch" indeed weighs in at a whopping 100 tons, having been collected by Royal Arctic Line divers and dockworkers near the Nuup Kangerlua fjord outside Nuuk, Greenland. 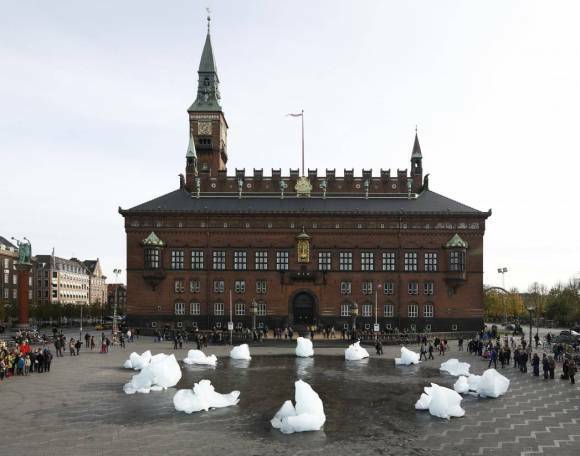 The pieces were shipped in four refrigerated containers to Denmark before being left to melt in the middle of the central city square. As they crack, break and disappear, members of the public are able to witness firsthand the death of Arctic ice. 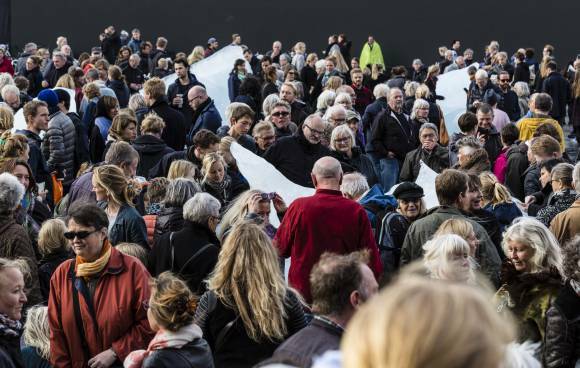 Frank Jensen, Copenhagen's mayor, and Morten Helveg Petersen, the Danish Minister for Climate, Energy and Building, stand behind the striking show. 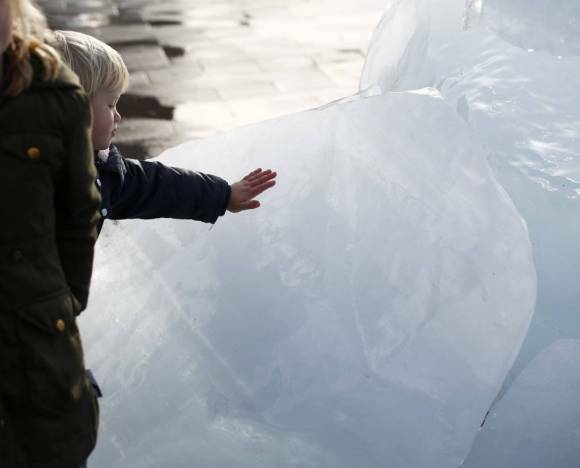 "Olafur Eliasson and Minik Rosing have created a work of art with 100 tons of inland ice. This number corresponds to the amount of inland ice melting every hundredth of a second," Petersen remarked in a press statement. "We can save the ice by burning less coal, conserving electricity, and driving better cars." "'Ice Watch' is an earnest reminder to us all about what is happening right now with the inland ice," Jensen added. "We are all part of the 'global we'; we must all work together to ensure a stable climate for future generations," Eliasson said. All photos below are courtesy of the Ice Watch project; credit: Anders Sune Berg.